The iconic Murray River is Australia’s longest and most spectacular. There is much to know about this legendary river, but we’ll start with these 7 fascinating facts. The Murray River is an incredible 2,530 km long. This makes it Australia’s longest single river and roughly seven times longer than the Thames which is which is 346 km long. Forms part of the Murray-Darling Basin, the driest major water system in the world. 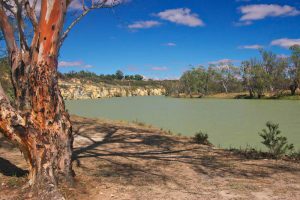 The Murray River is old – more than 60 million years old! The Murray River originates from the time Australia split from the supercontinent of Gondwanaland making it an ancient river. Is Home to Australia’s largest freshwater fish species. The Murray cod is Australia’s largest freshwater fish species, weighing from 5-22kg. This species was once widespread, but sadly their numbers are rapidly declining. The Murray River has been inhabited by indigenous Australians for at least 40,000 years. About 10,000 aboriginal sites have been located within the Murray-darling Basin. There is a Murray River Act 2003. The Murray River Act of 2003 is an act that ensures that the river is protected from activities that could affect its health. All users of the Murray River are required by law to protect it. Stunning river red gum forests grow on the banks of the Murray River. The river red gum is one of Australia’s most iconic trees and can grow up to 40 metres high. Visit the majestic Murray River! Hire a houseboat, visit vineyards and farmers markets, or take a walking tour. Discover more about exploring the Murray, read about the future of the Murray–Darling Basin or explore Tocumwal accommodation options. Tocumwal All Seasons is ready to welcome you and make you feel at home while you’re touring the Murray region. We offer a wide range of accommodation options including queen rooms, self-contained units and family rooms, all surrounded by lush, tropical gardens. Book your Tocumwal Motel Room today.